1,490km south of Darwin, 1,475km north of Adelaide. Alice Springs today is a modern town in the middle of nowhere, and it gets very hot in summer. It was originally established as a telegraph station in the middle of endless semi-desert. The Great Overland Telegraph Line through central Australia to Darwin and via submarine cable to Java was built in the 1870s and connected Australia to the outside world for the first time. Previously communication to London took weeks via sailing ships that were not guaranteed to ever reach their destination. Testament to Alice Springs harsh environment is the almost always dry Todd River that runs through town. As a novelty there is an annual boat race on the dry river bed where teams with bottomless boats pick them up and run to the finish line. The event has only had to be cancelled once, in 1994, because there was water in the river. 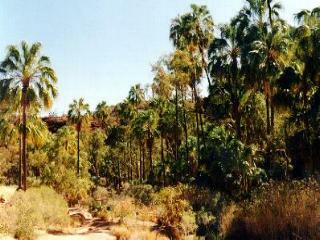 Alice Springs main attraction is its vicinity to spectacular arid mountain scenery. The West and less scenic East MacDonnell Ranges run just south of town. The Todd River, road and railway line pass through a narrow gap between them. 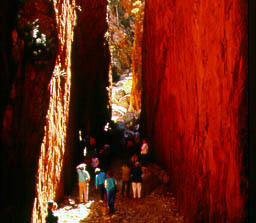 Organised tours to Ayres Rock, The Olgas and Kings Canyon also leave from Alice Springs. Central Australian Tourism Industry Association Office has many brochures and maps. Cnr Leichardt Tce and Gregory Tce. Phone 08 8952 5800. Open 9am to 6pm weekdays, 9am to 4pm weekends. Good road maps can be obtained from the Automobile Association of the Northern Territory (Gregory Tce, phone 08 8953 1322), the Department of Lands Planning and Environment (Gregory Tce, phone 08 8951 5316) and most petrol stations. Todd Mall is the main street. Among its shops are a number selling souvenirs and aboriginal art. Three kilometres north of town. This is one of 12 telegraph stations on the Great Overland Telegraph Line that once was the only communication line between Australia and the outside world. The line ran through central Australia to Darwin then via submarine cable to Java. There are a few stone buildings at the telegraph station and a small museum. Open daily 8am to 7pm, 9pm in summer. Phone 08 8952 1013. Entry adults $4, children $2. There is a semi-permanent waterhole here in the Todd River and is why the telegraph station was established in this spot. Just north of downtown, the small hill provides a view over the main street and town. Contains some aboriginal art and mineral exhibit. Upstairs in the Alice Plaza building, Todd Mall. Phone 08 8952 5378. Open weekdays 9am to 5pm, weekends 10am to 5pm. Entry $2. The flying doctor provides medical treatment to remote station properties and aboriginal communities. The flying doctors have a famous role in this vast scarcely populated land. They are a worthy charity organisation. There is a small museum at the base. Half hour tours $3. Stuart Tce. Phone 08 8952 1129. Open Monday to Saturday 9am to 4pm, Sunday 1pm to 4pm. The School of the Air also provides a vital role in outback Australia broadcasting lessons to school children living on remote cattle stations hundreds of kilometres from the nearest town. During school term you can hear the broadcasts. Head St. Open Monday to Saturday 8.30am to 4.30pm, Sunday 1.30pm to 4.30pm. Admission by donation. Houses Aboriginal spiritual artefacts. Larapinta Dve. Open 10am to 5pm. Admission charge $4. No entry after 4.30pm. Phone number unknown. 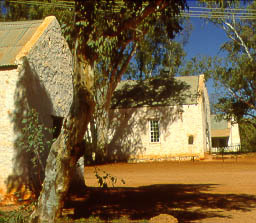 On Larapinta Dve this centre houses some works of the famous Aboriginal artist Albert Namatjira. Large painting on a circular wall of the inside of a building depicting all the sites in Alice Springs. Painted by Dutch artist Henk Guth. 65 Hartley St. Admission $3. Open Monday to Saturday 9am to 5pm, Sunday 1pm to 5pm. 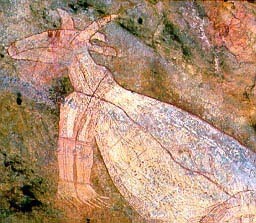 Aboriginal art is noted for is stylised animal pictures in earthy yellows, browns, reds and whites. The picture is often formed with many dots of paint. Aboriginal art is sold at the following locations. Go along even if just to look. Original Dreamtime Art Gallery 63 Todd Mall. Phone 08 8952 8861. Aboriginal Art Gallery 88 Todd St. Phone 08 8953 1005. Aboriginal Art & Cultural Centre at 86 Todd St is Aboriginal owned. Papunya Tula Artists at 78 Todd St is Aboriginal owned. Jukurrpa Artists on the corner of Gap Rd and Leichardt Tce is Aboriginal owned. Warumpi Arts at 105 Gregory Tce is Aboriginal owned. Central Australian Aboriginal Media Association is at 101 Todd St. The souvenir shops on Todd Mall also sell Aboriginal art. A number of operators offer desert safaris to Ayres Rock and other places like the Simpson Desert in modified 4WD vehicles of various sizes. Most safaris are 4-6 days long. One operator is AAT Kings. To find out more about the options available visit the tousist information office (Cnr Leichardt Tce and Gregory Tce). 10km south of town. The camel farm offers short camel rides ($5) and longer rides along the dry Todd river bed into town and back ($45, children $25). Rides to town depart from the farm at 10.30am and 2pm. Whole day treks cost $200. Phone 1800 808 499. There is also a reptile house here with snakes and lizards. Some distance away is a date farm. Balloon operators over Alice Springs are Outback Ballooning (phone 1800 809 790), Spinifex Ballooning (phone 1800 677 893) and Ballooning Downunder (phone 08 8952 8816). 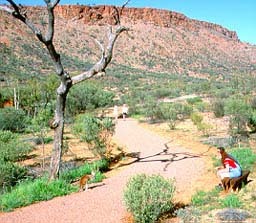 There are half day town tours ($45), Aboriginal cultural tours and numerous two day tours to Ayres Rock and the Olgas, three days including Kings Canyon. Visit tourist information for brochures and more details on all the tours. Alice Wanderer does circuits of the sights in Alice Springs from 9am to 3pm. It runs every 70 minutes. You can hop off and on anywhere you want. Cost $18 or $50 includes entry everywhere. Hotel pick ups can be arranged. Phone 08 8952 2111. AAT Kings has a three hour bus tour of the town sights for $45. 74 Todd St. Phone 08 8952 1700. Sahara Outback (phone 1800 806 240) has cheap two day Ayres Rock and the Olgas camping tours for $220. Add $100 and an extra day for Kings Canyon as well. Other cheap operators are AKT Holidays (phone 1800 891 121), Tracks Outback Expeditions (phone 1800 641 100) and Trek-About Tours (phone 1800 818 011). Airnorth Safaris (phone 8952 6666) has one day air safaris to Ayres Rock from Alice Springs ($439, children $339. $100 less if you take the bus one way instead). 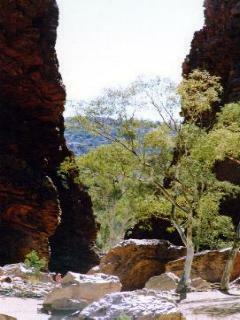 Other tours go to the West and East MacDonnell Ranges. YHA Pioneer Hostel Cnr Leichardt Tce and Parsons St. Phone 08 8952 8855. Dorm $14, twin $15 per person. Air-conditioned, pool, bike hire. Melanka Lodge is a large place. The popular with travellers Waterhole Bar is attached. 94 Todd Rd. Phone 1800 815 066. Dorm $14, twin/double $16 per person. Single/double with private bathroom, own fridge and TV is $55/$65. Kitchen, cafeteria, bar. Alice Lodge 4 Mueller St over the river from town. Phone 08 8953 1975. Dorm $12-$14, single $25, double $32. Kitchen, pool, BBQ, laundry, garden, courtesy bus. Ossie’s Homestead 18 Warburton St also on the other side of the river. Phone 1800 628 211. Dorm $12-14, Single $25, double $32. Pool, courtesy bus, pet kangaroo, trail rides ($60-$205). Toddy’s Resort 41 Gap Rd. Phone 1800 806 240. Bed in 6 bed dorm is $10, or $12 in 6 bed dorm with own bathroom. Laundry, poor kitchen, cheap meals, bike hire. Elkes Resort is in 8 bed self contained apartments. Phone 08 8952 8134. Gap Rd. Bed $13, double $40. Legends Nightclub is in the Alice Plaza Building on Todd Mall. Bojangles is a restaurant that becomes a nightclub later. Todd St.
Alice Junction Tavern on Palm Circuit has a disco Friday and Saturday nights. Waterhole Bar is popular with backpackers and other travellers. 94 Todd Rd, attached to Melanka Lodge. Cinema Centre is on Todd St just north of Todd Mall. Lasseter’s Casino Barrett Dve. Phone 08 8952 5440. Airnorth flies to Ayres Rock three times daily and other locations in the Northern Territory. Phone 1800 627 474. The airport is 15km southeast of town. A taxi is around $20. The airport shuttle meets flight and takes travellers to their city accommodation for $9. Phone 08 8953 0310. Both go to Darwin ($150), Adelaide($135-150) and Yulara at Ayres Rock ($55-$84). McCafferty’s tends to be cheaper. Change at Three Ways for Queensland, Katherine for north Western Australia, Port Augusta for Perth and Erldunda for Ayres Rock. AAT Kings (phone 08 8952 1700) and Australian Pacific (phone 08 8952 6922) have tours to Ayres Rock too. The Ghan goes to Adelaide for $170, $351 economy sleeper, $539 first class sleeper. Departures from Alice Springs are Friday and Tuesday at 2pm arriving in Adelaide at 10am the following day. Alice Springs railway station is 2.5km west of town. Brits Australia has camper vans. Cnr Stuart Hwy and Power St. Phone 1800 331 454. Territory Rent-a Car Cnr Stott Tce & Hartley St and at the airport. Phone 1800 891 125. 4WD hire is around $100 a day for a small Suzuki Vitara and $150 for a big Toyota Landcruiser. The Northern Territiory only has a couple of sealed roads, but those they do have are well maintained and go to the major tourist destinations. Remember distances are long the terrain remote and petrol is only available every 200km or so. Breakdowns are a big hassle. Breaking down or getting lost on infrequently used gravel roads and tracks is life threatening - Read Remote Roads Safety first, take supplies, take lots of water and tell authorities where you intend to go and when you will arrive at your destination. Alice Springs has a limited metropolitan bus system. The Alice Wanderer has an organised hop-on hop-off bus tour. See Organised Tours above. Bike hire is available in Alice Springs but cycling is not the most comfortable option in hot weather. It is cooler in winter. Alice Springs Taxis Phone 08 8952 1877. The narrow dry range protruding sharply from the flat dry plain is broken in places by spectacular chasms and gorges through. Heavitree Gap just south of Alice Springs through which the Todd River passes is the widest gap and separates the West and less spectacular East MacDonnell Ranges. A day trip along the West MacDonnell Ranges can be made from Alice Springs. There is no transport. Either take your own vehicle or go on an organised tour from Alice Springs. 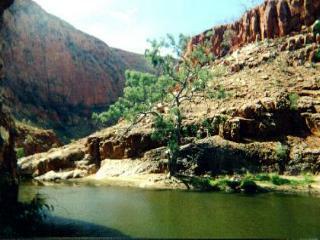 A big swimming hole where Ellery creek has carved a gap through the range. Another pleasant swimming hole that is less visited due to the gravel access road. You can swim through the chasm. Here you can see coloured rocks exposed of the sort Aborigines use as colouring for their paintings and artwork. 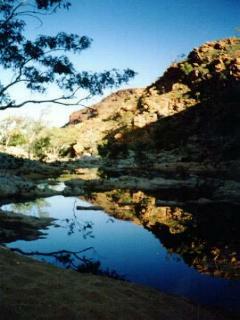 Glen Helen Gorge is an even larger gorge on the usually dry Finke River. Glen Helen Homestead has a cafe. The sealed road ends at Glen Helen. The spectacular Ayres Rock is Australia’s most famous natural attraction. It is 443km southwest of Alice Springs. Also see The Olgas there and if time permits King Canyon a further 300km away. Going north along the Stuart Highway you pass through Tennant Creek and Katherine. Do not miss the wetlands at Kakadu National Park near Darwin. Going south along the Stuart Highway you pass the turn-off to Ayres Rock, the opal mining town of Coober Pedy, army rocket launching township of Woomera and Port Augusta. Port Augusta is a major road and rail junction with connection elsewhere. Copyright © 2000 Graham Warren. Backpackers Guide to Australia (TM) is a trademark.